Wilson offers an outstanding program of study in psychology that encompasses theory, statistics, research projects and service learning opportunities. Psychology adopts a rigorous, scientific approach to understanding behavior - an approach that provides the solid foundation necessary for admission to graduate programs and/or for immediate employment in a myriad of service-based occupations. In addition to courses that introduce students to the major theoretical perspectives in psychology, the major also requires skill-based courses in statistics and research methods and the use of statistical analysis software programs to help the student master the basics of designing empirical research studies. Furthermore, students are required to participate in laboratory work and conduct their own research (there are many additional options for engaging in research and service learning projects). This is, in part, because human behavior often can be studied best outside of the classroom and because research projects, internships and other types of practical experiences are important preparation for graduate school and careers in the behavioral sciences. As practical as it is popular, a major in psychology readily translates into careers in teaching, counseling, research, social work, health sciences, advertising, marketing, personnel management, conflict mediation, forensics and more. Some careers require only the baccalaureate degree while others require graduate or professional training. In both, Wilson students are well-prepared for obtaining placements. Faculty assist in designing a program of study that meets admissions requirements for graduate school and can often suggest institutions based on students’ career objectives. 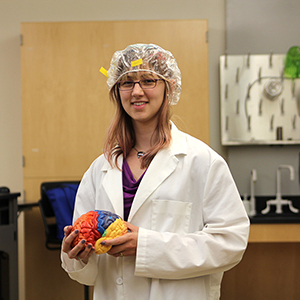 The major in psychology focuses primarily on understanding principles of human behaviors from a variety of perspectives: neurological, cognitive, social, developmental, health and emotional. However, taking an interdisciplinary approach to learning and development, students are also required to take courses in biology and sociology resulting in a complex interaction of the individual with interpersonal, intrapersonal and contextual forces that is critically examined. The program in psychology is designed to familiarize students with essential scientific methods and concepts as applied to the analysis of psychological research. In addition to the major in psychology, a minor is available for students wishing to supplement their education in this widely applicable area. The Edward and Sarah Anderson Psychology Prize was established through the efforts of the Wilson College Psychology Club in recognition of Professors Edward and Sarah Anderson for their devotion to the discipline of psychology at Wilson College from 1939 to 1970. This cash prize is awarded to a graduating senior for outstanding scholarship in the discipline of psychology.